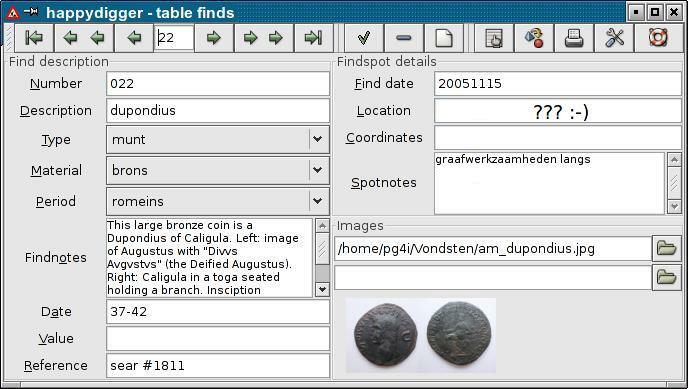 Happydigger is a program which you can be used for cataloging archaeological finds. It is intended both for semi-professional use and by amateurs (e.g. metal detectorists) who want to keep track of their finds. Data is stored into a database with extensive find and findspot details. If images are available, they will be displayed together with the find information. You need the gtk+-2.0 version 2.12 and sqlite3 development libraries and headers to compile happydigger. Current version is 3.0. You can find the source code, fedora core 6 rpm and windows binary here. The user interface is available in english and dutch. Screenshot of the main window. Now you can use the new version of happydigger. Version 3.0 adds printing support. It is also possible to export your database to html pages which you can upload to a webserver. A windows binary has also been added. Version 3.1 updates French and Swedish. It adds the German language. 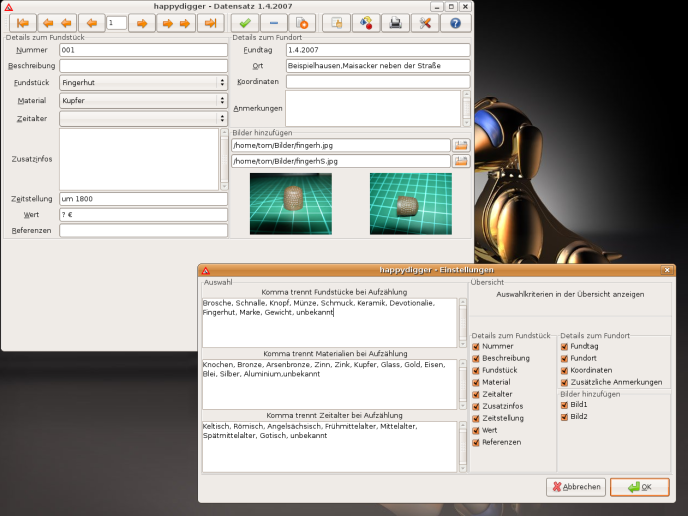 Here is a screenshot by Thomas Höfler which shows the program in German on Ubuntu 7.04 with Gnome 2.18. Version 3.2 fixes compilation issues with the most recent version of gtk+, which is 2.12.0. This version is needed to compile happydigger. Because of this only the source code is distributed. There are no added features or other changes. Since November 4th, 2005, happydigger has a project page at savannah, which you can use for bug reports and support. Please follow this link. A mailing list has been created for user support at http://lists.nongnu.org/mailman/listinfo/happydigger-user. Contact: "pg4i at amsat dot org".